Laws which were supposed by the Rabbis to have been binding upon mankind at large even before the revelation at Sinai, and which are still binding upon non-Jews. The term Noachian indicates the universality of these ordinances, since the whole human race was supposed to be descended from the three sons of Noah, who alone survived the Flood. 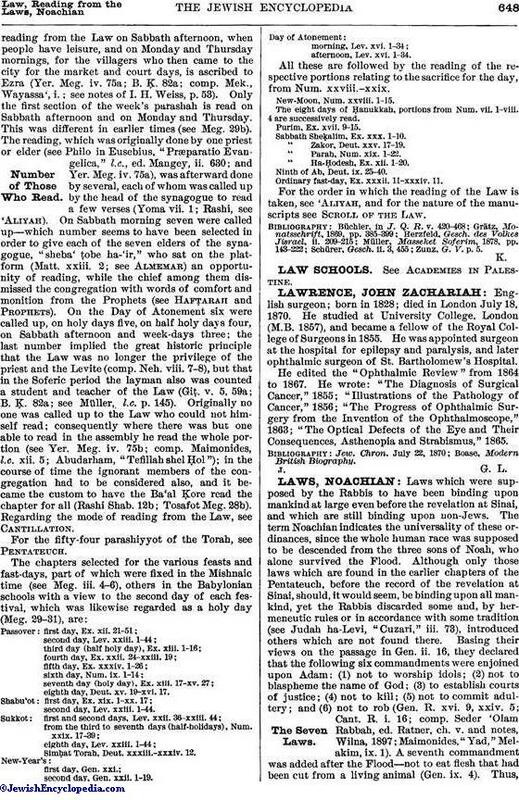 Although only those laws which are found in the earlier chapters of the Pentateuch, before the record of the revelation at Sinai, should, it would seem, be binding upon all mankind, yet the Rabbis discarded some and, by hermeneutic rules or in accordance with some tradition (see Judah ha-Levi, "Cuzari," iii. 73), introduced others which are not found there. Basing their views on the passage in Gen. ii. 16, they declared that the following six commandments were enjoined upon Adam: (1) not to worship idols; (2) not to blaspheme the name of God; (3) to establish courts of justice; (4) not to kill; (5) not to commit adultery; and (6) not to rob (Gen. R. xvi. 9, xxiv. 5; Cant. R. i. 16; comp. Seder 'Olam Rabbah, ed. Ratner, ch. v. and notes, Wilna, 1897; Maimonides, "Yad," Melakim, ix. 1). A seventh commandment was added after the Flood—not to eat flesh that had been cut from a living animal (Gen. ix. 4). Thus,the Talmud frequently speaks of "the seven laws of the sons of Noah," which were regarded as obligatory upon all mankind, in contradistinction to those that were binding upon Israelites only (Tosef., 'Ab. Zarah, ix. 4; Sanh. 56a et seq.). 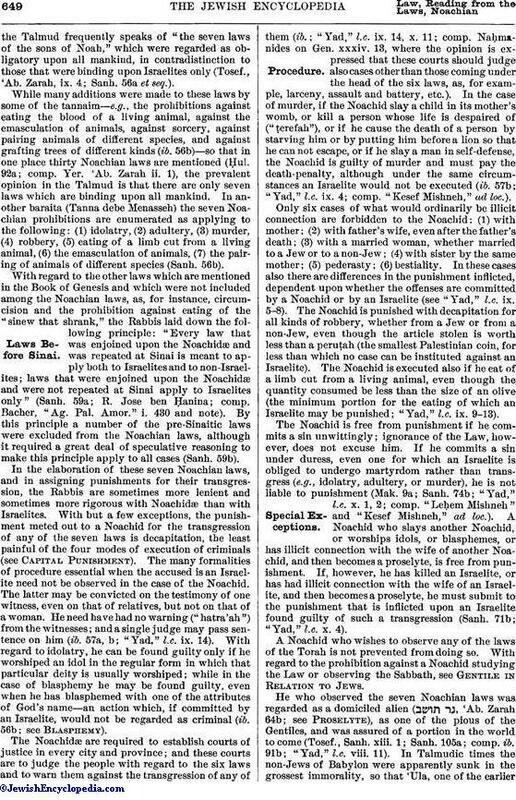 In the elaboration of these seven Noachian laws, and in assigning punishments for their transgression, the Rabbis are sometimes more lenient and sometimes more rigorous with Noachidæ than with Israelites. With but a few exceptions, the punishment meted out to a Noachid for the transgression of any of the seven laws is decapitation, the least painful of the four modes of execution of criminals (see Capital Punishment). The many formalities of procedure essential when the accused is an Israelite need not be observed in the case of the Noachid. The latter may be convicted on the testimony of one witness, even on that of relatives, but not on that of a woman. He need have had no warning ("hatra'ah") from the witnesses; and a single judge may pass sentence on him (ib. 57a, b; "Yad," l.c. ix. 14). 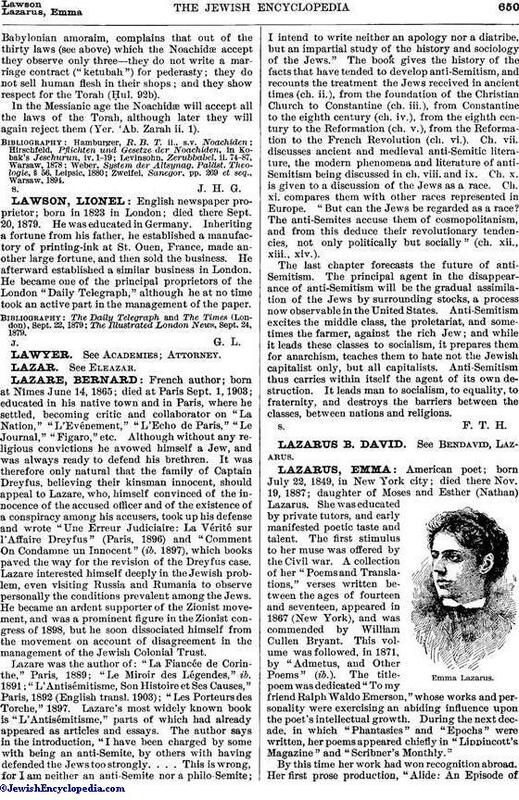 With regard to idolatry, he can be found guilty only if he worshiped an idol in the regular form in which that particular deity is usually worshiped; while in the case of blasphemy he may be found guilty, even when he has blasphemed with one of the attributes of God's name—an action which, if committed by an Israelite, would not be regarded as criminal (ib. 56b; see Blasphemy). The Noachid is free from punishment if he commits a sin unwittingly; ignorance of the Law, however, does not excuse him. If he commits a sin under duress, even one for which an Israelite is obliged to undergo martyrdom rather than transgress (e.g., idolatry, adultery, or murder), he is not liable to punishment (Mak. 9a; Sanh. 74b; "Yad," l.c. x. 1, 2; comp. "Leḥem Mishneh" and "Kesef Mishneh," ad loc.). A Noachid who slays another Noachid, or worships idols, or blasphemes, or has illicit connection with the wife of another Noachid, and then becomes a proselyte, is free from punishment. If, however, he has killed an Israelite, or has had illicit connection with the wife of an Israelite, and then becomes a proselyte, he must submit to the punishment that is inflicted upon an Israelite found guilty of such a transgression (Sanh. 71b; "Yad," l.c. x. 4). A Noachid who wishes to observe any of the laws of the Torah is not prevented from doing so. With regard to the prohibition against a Noachid studying the Law or observing the Sabbath, see Gentile in Relation to Jews. He who observed the seven Noachian laws was regarded as a domiciled alien ( , 'Ab. Zarah 64b; see Proselyte), as one of the pious of the Gentiles, and was assured of a portion in the world to come (Tosef., Sanh. xiii. 1; Sanh. 105a; comp. ib. 91b; "Yad," l.c. viii. 11). In Talmudic times the non-Jews of Babylon were apparently sunk in the grossest immorality, so that 'Ula, one of the earlierBabylonian amoraim, complains that out of the thirty laws (see above) which the Noachidæ accept they observe only three—they do not write a marriage contract ("ketubah") for pederasty; they do not sell human flesh in their shops; and they show respect for the Torah (Ḥul. 92b). In the Messianic age the Noachidæ will accept all the laws of the Torah, although later they will again reject them (Yer. 'Ab. Zarah ii. 1). Zweifel, Sanegor, pp. 269 et seq., Warsaw, 1894.